Potato, the world’s favorite root vegetable. Not very beautiful when it first comes off the soil but it is cheap, very nutritious and the best accompaniment for fish, meat or vegetable dishes. A delicious yet healthy way to cook them that competes equally in taste and texture with french fries, which we all know taste heavenly, is to roast them; roast them in such a way that will make them extra crispy on the outside and super-fluffy on the inside. Prepare a feta cheese dip for them to bathe in and your lunch is ready! Peel potatoes and cut them into 3 cm pieces. Wash them well and put them into a saucepan with cold, lightly salted water. Boil them at medium heat for approximately 7 minutes or until partially cooked. Careful not to cook them completely. Drain them and let them steam dry for a couple of minutes. Put them back into the saucepan and shake them vigorously to create rough edges. Put your potatoes into a roasting tray and sprinkle olive oil over them. 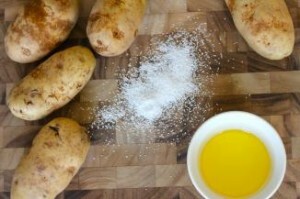 Season with salt and pepper and use a spoon to mix the potatoes for the olive oil to fully cover them. Roast potatoes for 30 minutes until lightly golden. Take the tray out of the oven and give it a good shake. Put back in the oven for 40 minutes or until golden and crisp. When ready, take them out of the oven and transfer potatoes into a plate lined with kitchen paper to absorb any excess oil. While your potatoes and resting, quickly put all ingredients for your feta cheese dip, except the herbs, into a blender and mix them into a smooth paste. Then, add the fresh herbs and mix them in gently. If your dip is too thick add a bit of extra yogurt and if it is too thin add a bit more feta cheese. By the time you finish preparing the dip, the potatoes will be free of any excess oil. 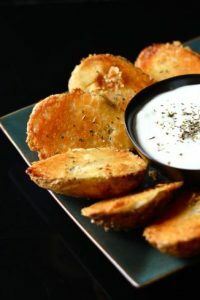 Transfer them into a clean plate, put your dip into a small bowl and enjoy the most crispy roasted potatoes ever. If you are not afraid of extra calories, replace olive oil with butter or, for the daredevils, goose fat. If you want to season your potatoes with fresh or dried herbs, rosemary and garlic make a perfect combination, put them in the last 40 minutes of roasting time (step 7) otherwise they will get overcooked and bitter. For the hot & spicy lovers, fear not to use chilli powder to season you potatoes before roasting them. The feta cheese dip will cool down your palate.